On the outskirts of Joya d'Arena, small villages fight for survival against the onslaught of sorcerers and raiders. Mara's village has been safe--so far--but Mara decides to escape anyway. Escape from her harsh, abusive father. Escape with her first love. But when their plans fall on the same day that the animagi burn the village to the ground, Mara faces losses that could destroy her. She's a survivor, though. She is going to make it through the mountains, and she is going to protect the refugees following her. Because there's a rumored safe haven . . . and some say they have found the Chosen One. 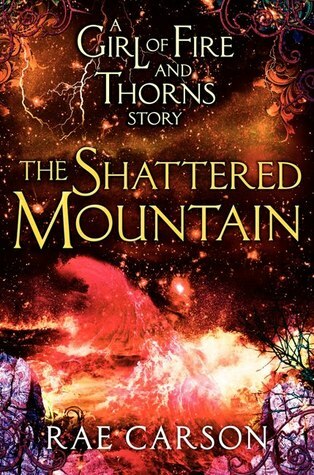 Told from Mara's point-of-view, The Shattered Mountain is an alternate perspective of the beginning of the acclaimed The Girl of Fire and Thorns. I enjoyed this novella, but liked The King's Guard better. 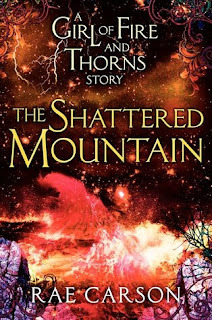 The Shattered Mountain occurs before the events in book one, The Girl of Fire and Thorns, and tells Mara's story. The Shattered Mountain is told in a first-person narrative, with Mara as the narrator. It's been so long since I read The Girl of Fire and Thorns, that I didn't immediately remember the characters in this story. I knew Mara's name was familiar but I couldn't place her. I wish that I would have at least re-read my reviews of the first two books in the series before reading Carson's novellas. I think I would have enjoyed The Shattered Mountain more if I weren't constantly trying to remember details about the world and characters. I had a lot of respect for Mara: she has a terrible home life with her father and goes though the unthinkable when her village is attacked by the Inviernos. She is strong, level-headed, and becomes the leader of the small band of refugees from her village. What kept me from loving The Shattered Mountain was how sad it was. The entire story was just heartbreaking, and while there was a hopeful ending, the book left me feeling somber. I'm glad I read this The Shattered Mountain, and would recommend it to fans of the series. The best thing about reading The Shattered Mountain was that it got me excited about the series again, and I'm really looking forward to book three, The Bitter Kingdom, out later this month!